Blockbuster bestselling author Sherrilyn Kenyon returns to the epic saga of the Dark-Hunters--and introduces a hero who is utterly out of this world. His name is Cadegan. Centuries ago, he was viciously betrayed by the only person he'd ever trusted and was cast into an immortal prison. Forced against his will to do good, he hates everything in life. All he wants is a way out. 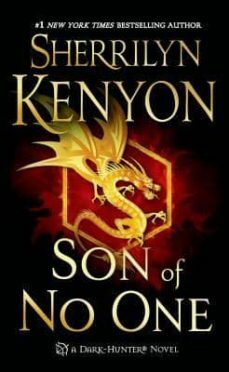 But then he meets a woman who shakes him to the core..."　SON OF NO ONE "Josette has been down on her luck, but she has made an unstable peace with the beast by taking a job photographing a local paranormal group. The only paranormal thing Josette believes in is the miracle that keeps her rusted-out hoopty running...until she meets Cadegan. Is he for real? Cadegan can't help but wonder the same about her: The last time he felt this way about a woman, it cost him everything. He knows he has to stay away from Josette--for his own good, as well as hers--but the unleashed demon is hell-bent on consuming her soul. If one more innocent is taken, Cadegan's fate will make his current hell look like paradise. But how can he keep Josette safe when just being with her is the greatest threat of all? "Arguably the most in-demand and prolific author in America these days." --"Publishers Weekly"
Espero que lo traduzcan pronto al castellano,pues soy seguidora de la saga.